Sometimes we need to stop — to think about the ways we wreak havoc in the world. A crowd gathered by the window, staring out: Our plane had arrived. Early summer on a budget carrier, there were fewer wing-tipped passengers waiting than usual, more families in flip-flops, plenty of kids dragging mini roller bags. There’d be no empty seats on this plane. We’d take a short hop to Oakland then transfer to Seattle, Denver, Minneapolis, and beyond. With the boarding call expected any minute, the waiting area should have been loud and lively, but I emerged from the bathroom to utter silence. I stood on tiptoes to try to see over the crowd, three rows deep, but I could not. “What’s going on?” I whispered. I’d seen a cop earlier, fully uniformed, not TSA, so I wondered if there was some kind of high-speed chase in progress on the tarmac — we weren’t that far from Los Angeles, after all — or maybe a medical emergency. I knelt down to try to see between people’s legs. As I did, I noticed that several men had removed their ball caps. Then I saw. A casket had descended the baggage chute, flag-draped, secured in a frame of two-by-fours. Soldiers marched forward, five men and one woman, in full-dress uniform. They lifted the casket — the body — in unison and moved it to a rolling gurney. Then they stepped aside. Heat rose in waves from the asphalt. Nearby mountains stood barely visible, shrouded in wildfire smoke and ocean haze. All planes and vehicles and orange-vested employees stopped. The family stepped from station wagons, a large family, mixed race, arm-in-arm, well-dressed. They approached the casket to have a moment to themselves. 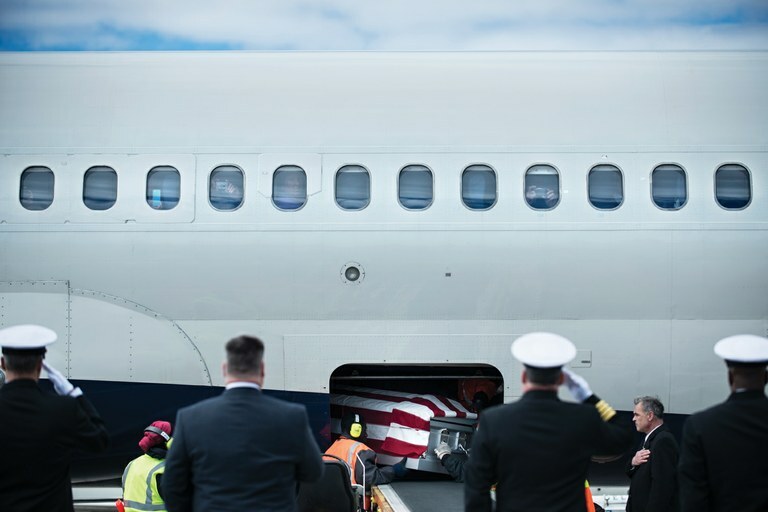 Ground crew remove a casket from a Delta flight as members of the U.S. Navy salute. We felt the guilt of voyeurism, the intrusion of privacy, but we couldn’t turn away. This was, as they say, one of ours. Less than a month since Memorial Day, and what did we remember, really, besides picnics? This. We would remember this. Once before, I had a similar experience in very different circumstances. I’d driven the long winding road at Point Reyes National Seashore. Near sunset, I reached a packed parking lot at the road’s end. But as I walked the last half-mile to the dramatic lighthouse surrounded by sea, I realized that I had yet to see another soul, despite all the cars. Where had everyone gone? Suddenly, I came around the corner. A very large crowd of people was leaning against a chain-link fence, in absolute silence, looking out. A man pointed toward the sea, and I gazed out for a silent minute until a gray whale surfaced, then another, then another, more whales than I’d ever seen in my life, and the people oooohed and aaaahed, fireworks-style, but did not otherwise speak. When the whales submerged, we stood in silence until they surfaced again. This lasted three-quarters of an hour. Only when the whales moved north and the sun began to set and we dispersed did I realize several people in the group did not speak English. Iraqandafghanistan. Are these wars — is any war — right or wrong? Are migrating gray whales wonders of creation or the last of their species in this age of extinction? We can stop to analyze — we should, always, pause to think — about the ways we’re complicit, how the choices we make, deliberate or not, wreak havoc in the world. But sometimes we just need to stop. Together. Like a shared reflex. We don’t even have to think about it. On the tarmac, family members bowed their heads, fingered the edge of the flag, and wrapped themselves around each other as their hair and clothes grew disheveled in the heat and wind. Then, at last, they backed away. The soldiers marched to the gurney and lifted the casket into a hearse, which drove away followed by the family cars. Inside the terminal, no one dared move. Kids fidgeted and were shushed. I’d been kneeling longer than I liked to, but I stayed kneeling. Not long afterward, bags began to drop from the chute and we lined up to board, no longer silent, but not loud either. Once we sat and buckled ourselves in, the pilot spoke over the intercom, voice wavering, to say what an honor it was to have brought a soldier home to a final resting place. Meanwhile, the rest of us were on the move to Oakland, Seattle, Denver, Minneapolis and beyond. We taxied fast and lifted into the air, higher and higher, above the tarmac, then the mountains, strangers bound together, the binds loosening as smoke settled thick in the canyons below.